One of the things I try to impress on folk whenever I do a talk about web stats is how showing charts of mean (that is, simple averages) numbers of visitors or time on site is all but useless, because the actual distribution of values is not likely to be normal, and so the simple averages reported are, too all intents and purposes, not good for anything. where (R>0 AND S>0) after the select statement and before order by. Using the same data page , we can create other visualisations within the Many Eyes Wikified environment that allow us to explore the data in a little more detail. So for example, here’s a bit more detail about the funding of quangos in the Department of Health. 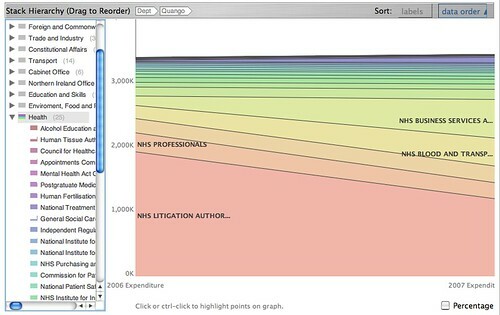 Parallel bands show that quangos spent equivalent amounts in 2006 and 2007, lines that diverge going from left to right show an increase in expenditure, and lines that converge going from left to right depict decreasing expenditure. Compared with just trawling through the spreadsheet data, I think there is a lot to be said for using visualisations to identify out of the norm data points (e.g. 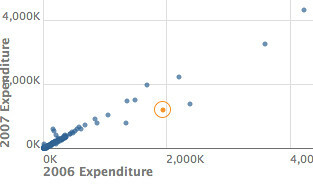 using the scatterplot), or unpacking totals (as in the case of departmentally funded quango expenditure) in a quick and easy way as a starting point to exploring the data in a more systematic way, for example in order to ask journalistic questions (whatever they might be). 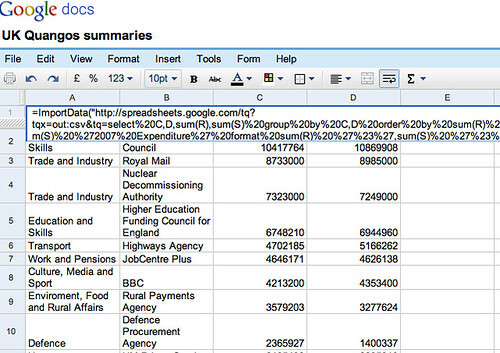 My tweetwatching has been a little sporadic of late, so I haven’t really been keeping up with the data sets that keep being posted to the Guardian Datablog, but today I had a quick skim through some of the recent uploads and had my eye caught by a post about funding of UK government quangos (Every quango in Britain [spreadsheet]). 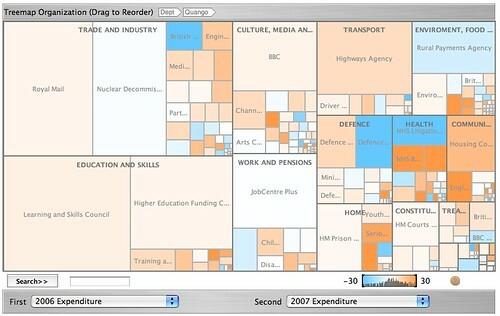 What I’ll show in this post is how to construct a query on one of the quangos data sheets that can then be visualised as a change treemap, showing at a single glance how funding over all the quangos (arranged by sponsor department) has changed over the period 2006-2007. The quangos spreadsheet is split into several different areas and at face value is quite hard to make sense of (what’s the difference in status (and provenance of the data) between the NHS and Health quangos, for example? 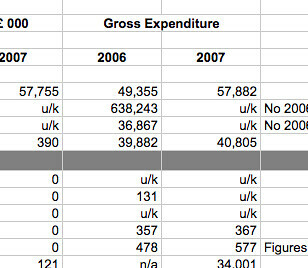 But I take nothing if not a pragmatic view about all this data stuff, and whilst there may be, err, issues with doing “proper” data journalism with this spreadsheet, I think we can still get value from just seeing what sorts of technology enhanced questions we might ask of this data, such as it is (as wll as identifying any problems with the data as it is presented), and as a result maybe identifying various issues with how to present and engage with this data were it to be republished again. As ever, my doodles don’t properly acknowledge the provenance or source of the data, nor do I try to make any sense out of the data or look for any specific ‘meaning’ within it – I’m still at the stage of sharpening my technology pencil and seeing what sorts of marks it can make – but this is something I know I don’t do, and will be something I start to look at somewhen, honest! 1) is the data clean enough to run summarising queries on the data (that is, queries that summed totals for different departments)? 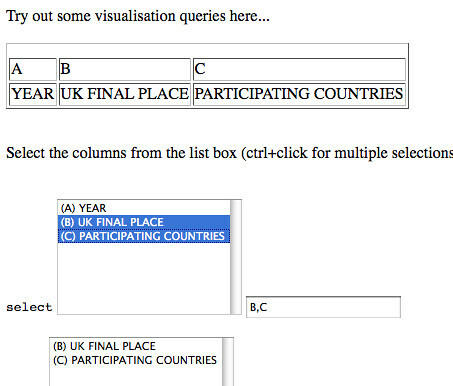 2) is the data clean enough to not break Many Eyes Wikified if i pass it to that visualisation tool via a CSV feed? 3) how do I write a query that specifies column headings (the headings in the spreadsheet leave something to be desired, at times….)? The spreadsheet I chose to play with was the Westminster sheet, which you can find from here: UK Quangos [Guardian Datastore] (you’ll need to select the appropriate tab). So, the first thing I noticed are the two columns on the left – Government departments and presumably the quangos sponsored by those departments. And what these suggested to me were that I should be able to generate reports that summarise expenditure over all quangos in each department. (Whether or not this is interesting, I don’t know; but it’s something that we should be able to do easily enough, and it may spark off other questions in our mind). So we have our basic summary report, and can now use the CSV output of the spreadsheet so that it can be transported elsewhere. There are two things we need to do now. Blue is decrease from 2006 to 2007, orange is an increase. 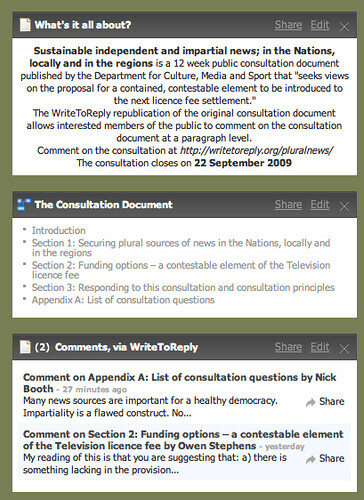 This idea, of microchunking particular elements of a consultation and then trying to use these microchunks to draw people into commenting on a consultation document, is one that Joss Winn and I have casually explored in the context of WriteToReply. In that case, we discussed whether or not we should pull out intriguing facts or potentially contentious questions that we could then tweet, along with a link to the appropriate part of the consultation document, in order to entice people into commenting, either directly on the WriteToReply site, or by remote commenting (that is, posting a blog comment or tweet that links back to a particular paragraph on the WriteToReply site site that we can then track via a Trackback). One thing to note here is that rathr than linking to the actual paragraph that contains the question, which is what we’d normally do, these tweets link to paragraphs that preview, and provide the context for, the questions. So if you follow the link, you are lead into the body of the consultation document, and if you read on you then come to the question included in the tweet. That is, the tweet provides the question that sets the contest, the link leads through to the part of the consultation that provides the context for the question, and then to the question as it appears in the consultation doc. Also on Twitter, Joss and I fell into a conversation with Steph and Richard Stirling about the different audiences for consultation docs and what the appropriate means of publication are for those different audiences. So for example, Steph suggested “Consultations have multiple audiences. Suspect downloadable PDFs actually not bad for policy folk. But for public?” [ref], which was backed up by Richard: “I agree with @lesteph’s point. As a policy person I often want to read the whole doc – not sections. PDF works.” [ref]. 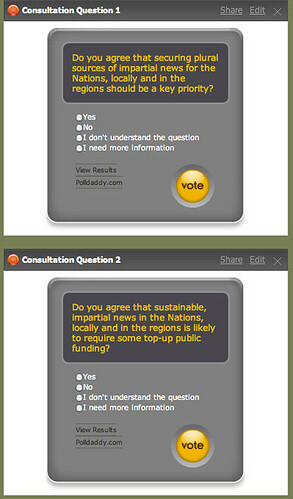 There are dangers with the headline approach, of course, as the ‘simplistic’ tweeted questions shown above suggest… At the simplest reading, they just solicit a trivial yes/no answer, rather than an informed comment. But bear this in mind too – those questions were taken from the consultation document itself. A further thing that’s interesting to note is how the consultation document is actually constructed. 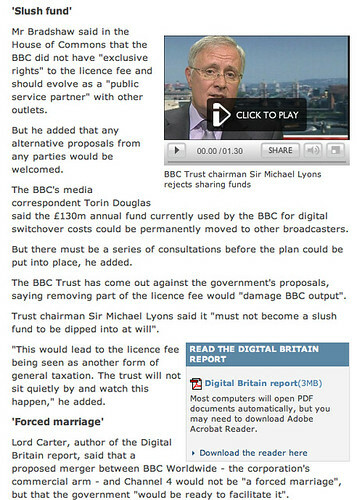 The ‘argument’, such as it, and the issues that the consultation wishes to be taken into account, are used to preface the actual questions (see the sections on Potential Sources of Top-Up Funding or Protecting the BBC’s Funding for a couple of examples). That is, some issues a presented, and then the question is asked. But how likely is this to work as an engagement strategy? A cold start conversational strategy would probably be more likely to start with a question, followed by a discussion (or argument) and an agreement to disagree. There is an issue of circularity here, of course – the news reports presented to date stem largely from responses to the original consultation call, so rather than setting the consultation in context, you could argue they are just responses to it. But we have to start somewhere, and we are, after all, making this stuff up as we go along. If nothing else, we are exploring how to re-balance the presentation of the consultation doc and associated news stories compared to the mode of presentation used by the BBC et al. The Guardian OpenPlatform DataStore – Just a Toy, or a Trusted Resource? When the Guardian launched their OpenPlatform DataStore, a collection of public data, curated by Guardian folk, hosted on Google Spreadsheets, it raised the question as to whether this initiative would influence the attitude of the Office of National Statistics, and in particular the way they publish their results (e.g. Guardian Data Store: threat to ONS or its saviour?). I’ve already suggested that what I’d quite like to see is plug’n’play public data that’s easy for people to play with in a variety of ways, and publishing it via Google Spreadsheets certainly lowers quite a few barriers to entry from a technical perspective which can make life easier for statisticians and the visualisers, and reduce the need for the data mungers, the poor folks who go through “the painful process of cleaning, parsing, and proofing one’s data before it’s suitable for analysis. Real world data is messy” as well as providing access to data where it is difficult to access: “related to munging but certainly far less painful is the ability to retrieve, slice, and dice well-structured data from persistent data stores”. But if you don’t take care of the data you’re publishing, the even though there are friendly APIs to the data it doesn’t necessarily follow that the data will be useful. Here’s my thought: open data needs a new breed of data gardeners – not necessarily civil servants, but people who know data, what it means and how to use it, and have a role like the editors of Wikipedia or the mods of a busy forum in keeping it clean and useful for the rest of us. … Support them with some data groundsmen with heavy-lifting tools and technical skills to organise, format, publish and protect large datasets. 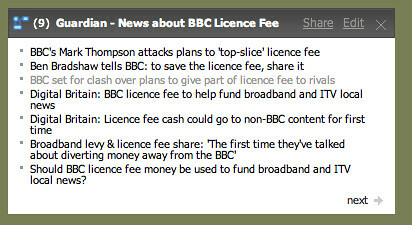 So with all that in mind, is the Guardian DataStore adding value to the data in the data store in an accessibility sense by reducing the need for data mungers to have to process the data so that it can be used in a plug’n’play way by the statisticians and the data visualisers, whether they’re professionals, amateurs or good old Jo Public? Looking back to the HE teaching related datasets, we see they are both listed on the http://www.guardian.co.uk/news/datablog+education/higher-education page. So might we then expect them to be ‘compatible’ datasets in some sense? That is, do the HE data sets share common values, for instance in the way the HEIs are named? If we generate a couple of queries on to the university satisfaction tables and the dropout tables (maybe trying to look for correlations between drop out rate and student satisfaction) by pulling the results from different queries on those tables in to a data grid within a Google spreadsheet (cf. the approach taken in Using Google Spreadsheets and Viz API Queries to Roll Your Own Data Rich Version of Google Squared on Steroids (Almost…)), what do we gt? So already, even with quite a young datastore, we have an issue with data quality. In Data Driven: Profiting from Your Most Important Business Asset, Thomas Redman identifies “seven common data quality issues) which include the related problems of too much data (i.e. multiple copies of the same data in different places – that is, redundancy) and data inconsistency across sources (not a problem the datastore suffers from – yet?) and poor data definition (p41 -preview available on Google books?). This latter issue, poor data definition, is evident in the naming of the HEI institutions above: I can’t simply import the overall tables and dropout tables into DabbleDB and let it magically create a combined table based on common (i.e. canonical) HEI names (using the approach described in Mash/Combining Data from Three Separate Sources Using Dabble DB), for example) because the HEIs don’t have common names. So what does Redmond have to say about this (p.55)? – Prevent them at their source [in this case, the error is inconsistency and could have been prevented by using a common HEI naming scheme, OR providing another unique identifier that could act as a key across multiple data tables; but name is easier – because name is what people are likely to search by…). So is it the Guardian’s job to be curating this data, or tending it as one of Steph’s data gardeners/groundsmen might? If they want it to be a serious resource, then I would say so. But if it’s just a toy? Well, who cares…? 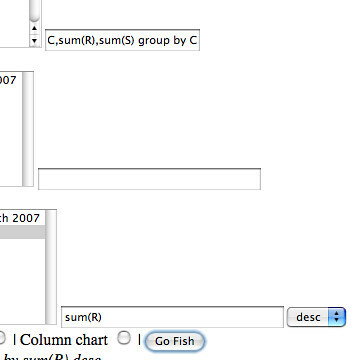 PS Just in passing, what other value might the DataStore add to spreadsheets to make them more amenable to “mashups”? For data like the university data, providing geo-data might be interesting (even at the crude level of just providing a single geographical co-ordinate for the central location of the institution). If I could easily get geo-data for the HEIs, and combine it with the satisfaction tables or dropout rates, it would be trivial to generate map based views of the data. Now call me naive, but I’d expect those DATA links to point to spreadsheets, as indeed the first two do, but the third points to another blog post and so I’ve lost trust in being able to use those DATA links (e.g. in a screenscraper) as a direct pointer to a spreadsheet. Author Tony HirstPosted on June 8, 2009 Categories Data, Stirring, ThinksesTags datablog, datastore, OpenPlatform8 Comments on The Guardian OpenPlatform DataStore – Just a Toy, or a Trusted Resource? So it seems that the Numeracy in the Newsroom blog liked the ‘roll your Google Squared’ toy that I rediscovered in Is Google Squared Just a Neatly Packaged and Generalised =googlelookup Array?. But how about if you wanted to roll your own square by pulling in data from data sources you had defined yourself, such as spreadsheets in the Guardian datastore? 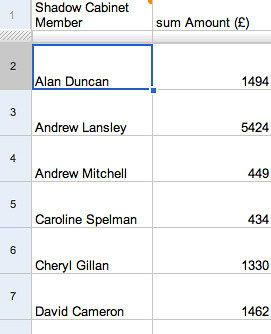 Well, it occurred to me that it should be easy enough to generate queries onto those spreadsheets (e.g. using the link generators described in First Steps Towards a Generic Google Spreadsheets Query Tool, or At Least, A Guardian Datastore Interactive Playground et al.) and roll them into a square. Okay – so I know I’ve lost you but I only have 10 mins to crank this post out, so I’ll walk you through a demo (ish). That is, we construct the URI around the name contained in the cell a couple of columns to the left, (data that was itself pulled in from a Tory party spreadsheet). 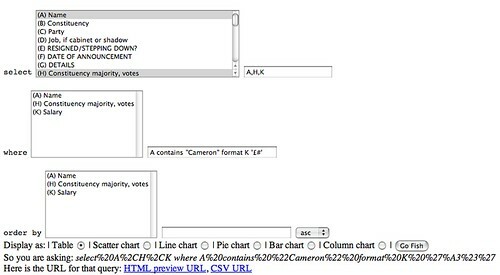 (Note that I’m generating an HTML preview, but you should be able to grab CSV too: just set tqx=out:csv). Remember, I generated an HTML preview table URI. (If you generated a CSV URI, use =importdata(C2). Note I was using CSV originally, but then it seemed to stop working, so I switched to HTML). Okay, so there’s an issue here – we’re only getting very other MP because the table headers are being pulled in (the same happens with CSV – I couldn’t find a way to get the importdata formula to suppress the header?). A clunky workaround you be to create another set of columns that pull in the other alternate rows (i.e. start pulling in data from row 3 rather than row 2). You’ve also got the header crap everywhere, but I’m guessing we could probably write a query language call that would pull out the data from this spreadsheet and ignore the rows containing the column headings. So – I can create a data square in a Google Spreadsheet that pulls in and essentially combines data from multiple spreadsheet data source that I know and trust, as long as there is a common key query term (name in this case). Prompted by a couple of comments from @Josswinn to be more transparent (?! ;-), here’s a glimpse into how I set about learning how to do something. 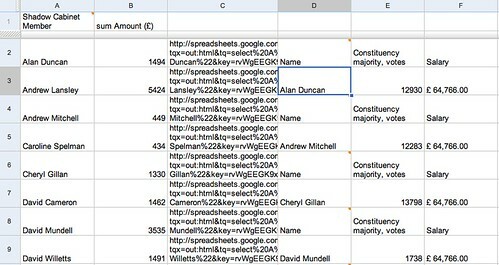 Hmm, ok… Google spreadsheets. I’ve just learned about how to write queries against Google spreadsheets using the visualisation API query language, so can I push that another step forward…? What don’t I know how to do that could be useful, and that I could try to demo in an app using this resource? How about this: a web page that lets me pull the result out for a searched for by name university. Okay, so it’d be nice to be able to search for the results of a given university in a given subject area, or maybe even compare the results of two universities in a given subject area? So to do that, do I need to learn how to do something new? If not, there’s no point, it’s just makework. Well, I don’t know how to grab a list of worksheet names from a Google spreadsheet, so that’d be something I could learn… So how to do that? Well, the query language only seems to work within a sheet, but there is a Google spreadsheets API I think? Let’s have a look: Google Spreadsheets APIs and Tools: Reference Guide. F**k it, why haven’t I looked at this before…?! Blah, blah, blah – ah: Spreadsheets query parameters reference. Quick scan… hmm, nothing obvious there about getting a list of worksheets. How about further up the page…? I have no idea what the “list and cells feeds” means, but I’m not interested in that; “lists all the worksheets within the spreadsheet identified by the specified key” is what I want. Okay, so where’s a URL pattern I can crib? Okay, that works… No obvious way of getting the gid of the worksheet number though, unless maybe I count the items and number each one…? The order of worksheets in the feed looks to be the sheet order, so I just need to count them 0,1,2 etc from the top of the list to gd the worksheet gid. Ah, there could be an opportunity here to try out the YQL Execute in a pipe trick? After all, the demo for that was an indexer for feed items, and because the API is chucking out RSS I need to use something like a pipe anyway to get a JSON version I can pull into my web page. Hmmm, what else is there on the docs page? 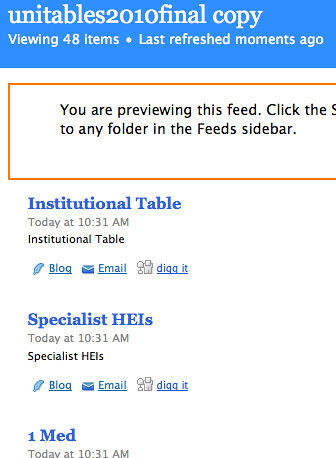 “alt, start-index, max-results Supported in all feed types. ” I wonder? Does alt stand for alternative formats maybe? Let’s try adding ?&alt=json to the URL – it may work, or it may relate to something completely other…. [Success] heh heh :-) Okay, so that means I don’t need the pipe? What else – anything that could be useful in the future? Hmm, seems like the Spreadsheets API actually supports queries too? So e.g. I can run a query to see if there is a sheet that contains “geo” maybe? – question: is there something I could do with that data that I don’t know how to do? – question refined: how about I pull out a list of the worksheets from the spreadsheet, and use that in e.g. a drop down box so students can choose a subject area from a list, then search for one, or compare two, HEIs in that subject area. I don’t know how to get the list, and I’m not sure about the best way of comparing two items, so I’ll probably learn something useful. 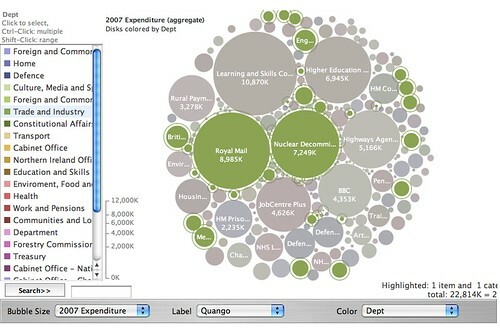 How’s about a generic query’n’viz tool for the Guardian datastore? My first (and maybe last) attempt at a back of an envelope, sometimes it works, sometimes it doesn’t, bare bones rapid prototype of just such a thing can be found here. In my original post on Making it a Little Easier to Use Google Spreadsheets as a Database (Hopefully! ), I sketched out a simple form for helping create calls to a Google spreadsheet using the Google visualisation API query language. I then extended this to try to make the query building a little more transparent: Last Night’s Update to the “Google Spreadsheets as a Database” Demo. Today’s step is to see how we can make it easier to pull in spreadsheets from the datastore collection as a whole. ISSUE 1: Sometimes the spreadsheet doesn’t load… I don’t know if this is down to something I’m (not) doing or not (if you’ve seen this sort of error and know a cause/fix, please post a comment below). I haven’t implemented chart labeling, or the ability to set what values are used for what bit of the chart, so chart compomnent default rules apply. By juggling the queries (including changing the order of columns that appear in the various text boxes), you can sometimes get a reasonable chart out. 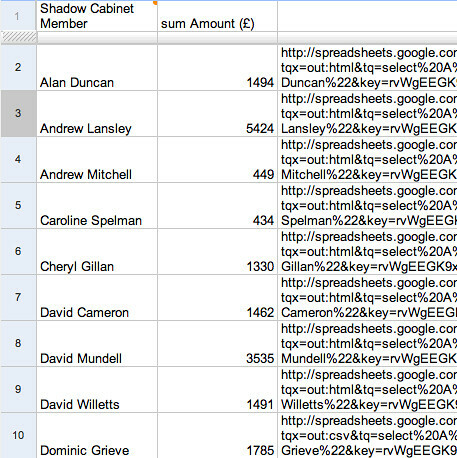 Of course, you can always just grab the CSV URL and then visualise the data in something like Many Eyes Wikified. The chart components I used are all taken from the Google Visualisation API, so they play nicely with the Google data source representation that holds the data values. – generate quick visualisation previews of different views of the data.